As a shopper, if it is important to you that retailers provide more responsibly-produced options, you're in luck. The environmental group Greenpeace reports U.S. retailers have made significant strides in offering consumers responsibly-sourced canned tuna. But that's mainly because of the proliferation of smaller, "disruptive" niche companies that have embedded responsibility into their culture and brand. The biggest producers, Greenpeace says, aren't doing so well. But the environmental group charges the three major U.S. tuna brands -- Chicken of the Sea, Bumble Bee, and StarKist -- are holding the industry back. “Retailers are quickly realizing that consumers want canned tuna products that they can feel good about feeding their families,” said Greenpeace USA Oceans Campaigner David Pinsky. “It’s unfortunate that tuna giants like Chicken of the Sea continue to talk a good game on sustainability and human rights, yet have not made the changes needed to shift a destructive industry." Whole Foods joined three other brands, Wild Planet, American Tuna, and Ocean Naturals, in the green category this year, with Greenpeace singling them out as the best canned tuna choices for shoppers. Whole Foods recently said it would only offer sustainable canned tuna by early next year. Greenpeace says that sets the bar for the rest of U.S. retailers. Wild Planet and American Tuna were tied at the top of the tuna rankings, with Greenpeace calling them "trusted sustainable tuna brands that continue to advocate for positive changes throughout the industry." There are a number of factors that go into sustainable tuna fishing practices, but most have to do with limiting the species caught in the nets to tuna, avoiding other types of fish that might be endangered. There are also different types of tuna and environmentalists say the type should be prominently displayed on the can. 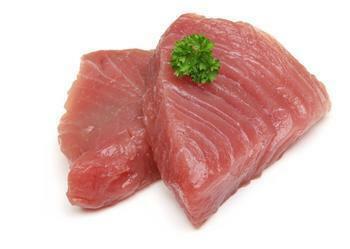 The three most popular types of canned tuna are Skipjack, Albacore, and Yellow Fin. Greenpeace charges the big three tuna brands have shown little improvement in policies and practices in the last 12 months. For the three, Chicken of the Sea ranked highest on sustainability and human rights, but Greenpeace says the company must do more to show its suppliers are meeting those goals.